So no updates for three months eh? I've been a little pre-occupied with other areas of life for a while, but now I'm back with loads of new stuff to rant and rave about. 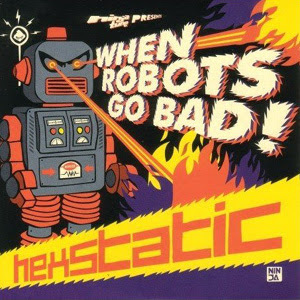 First off, it's Hexstatic's brand new album for the Ninja tune label - When Robots Go Bad. I've loved Hexstatic's work since their collaborations with Coldcut on the classic "Timber". Their brand new album takes them one step closer towards that crossover from underground electronica to mainstream acceptance. Special highlights for me are Roll Over (video below), Red Laser Beam, Freak Me, and A Different Place.